Compare Swift’s new island bed Challenger 580 with the 560 model and you’ll see it’s longer and instead of a small table unit in the centre-front position between the parallel settees, the 580 has a chest of drawers (with hinged extension tabletop). Its extra length means you get longer settees, giving you a wider double bed. Alternatively, the single beds are adequate to sleep younger members of the family. The kitchen area boasts a beautiful granite-effect sink. It’s made of tough resin that will resist scratches better than the matt metal sort. Swift’s kitchen sinks are always big and circular and you’ll never struggle to wash up even large plates and pans. There’s a chopping board cover which has a cut-out section so that you can use the tap at the same time as having most of the sink covered. There’s a plastic clip-on drainer – but that will take away most of your work surface so it’s best to keep it housed in its cupboard slot when it’s not in use. Fridge and cooker are both from Thetford. 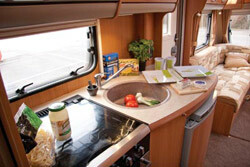 The hob is complete with mains hotplate as well as three gas burners, as is the Swift style. In the bedroom, the bedside shelves recessed into the wardrobes are larger (both deeper and taller) than in the previous model. The 580 gets some minor refreshing changes compared with the 560 – and a lot of difference in terms of lounge practicality and comfort. If you’re considering a fixed bed model as your next move, it’s worth remembering that an island bed layout often gives you a more cohesive bedroom than side fixed beds – and the 580 is a good example of this. You get wardrobes on each side of the bed with full-length hanging depth, plus shoe cupboards beneath. There’s a corner dressing table unit with two sockets and television point. Although this layout doesn’t get you a true en suite shower and washroom, you get the advantage that the little room is just as accessible to members of the family sleeping in the front area. And you do get a separate shower, with semi-circular smart dark frosted plastic screen. You’ll notice the domestic-style door, with chunky steel handle and firm-click mechanism. There’s a slim mirror, mounted onto a metal-effect strip on the outside of the washroom, with feature spotlight set into the roof just above it. Upholstery is unchanged from the 560; suede-effect edges and rich creams and fawns in a design that would suit most tastes. The Challenger range benefits from its width (2.29m). That’s especially obvious in the central area where you get plenty of space – deep television table above the heater, wide corridor, and general look of roominess. 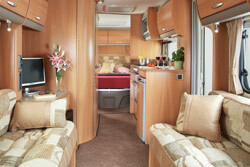 Swift say they listened to caravanners’ comments when they developed the 580. 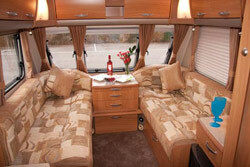 We say it’s an impressive package and they’ve done a good job as four can sleep, eat and lounge in comfort. 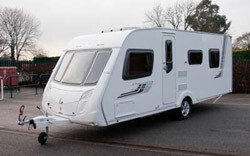 *Caravan Insurance cost based on 2009 Swift Challenger 580 valued at £14,995, fitted with hitchlock, wheelclamp and alarm (fitted as standard). Kept on drive behind locked gates at HX2 7RZ. Caravanners over 30 years old, claim free for 3 years and a member of a caravanning club. Premium includes insurance premium tax at 5%, 10% online discount and is correct as of 25.02.09. See a pattern yet… ? We have a Swift van too (09/530) but it does make you wonder WHO really is designing these caravans, an expert or an idiot ?Having only been a caravaner for around 10yrs now we normally only frequent green field sites (no electric hook up or nice loo/shower facilities) now this holds its own challenges, mainly being why do I drag so much heavy 240v equipment around… microwave etc.. more options please Swift an extra cupboard maybe, Why again do they fit an electric hot plate to almost ALL cookers, even worse fans for the ovens and grill’s when you have to make your battery last 10days or so… what planet are these designers on ? Also why fit an electric pump in such an inaccessible position (very front of lh bunk) but even worse fit it so it does not drain easily for winter storage, I now disconnect pipes to drain it manually, having spent many of my hard earned pounds replacing pressure switches due to freezing water cracking them because it did not drain fully. I know you are never going to get a one van fits all but at least give us some options we want or at least make sense ! It seems these problems are not just limited to the Swift group either. I for one agree with most other posters Swift do have support/customer service issues, it seems first they deny its their issue in a hope you’ll go away but eventually back down when you do start to get serious (mentioning courts) should one really have to get to that point to resolve an obvious design/issue/faults. Now our van is out of warranty I have made my own modifications to resolve blatant design faults, fitting extra support brackets etc,.. nothing unsafe to gas or mains, I’m not qualified for that. We now use a 120w solar panel (fitted flat on roof) along with two 120Ah batteries as I have to use electrical medical equipment each night which is a priority, so no battery power means its time to go home ! I have fitted our own led bulbs into the standard fittings which resulted in far better light output. As another problem,,,, The fridge heater unit had to be replaced after only 13 months, —- Could be a subject of the main outer door to caravan opening up on to the vents…. the door gets quite warm when left latched to outer skin on caravan. The fridge seems to be suffocated by the main caravan door covering the outer vents. Now SWIFT said not their problem contact THETFORD. So our lovely repair man contacted THETFORD and got the part required, then spent 90 minutes with his hands inside the back of the fridge from removing the outer vents. Another problem, the microwave kept TRIPPING the electric breaker on hook up, several times, so after contacting the site operator we were told Its not the site hook up, because the breaker had been replaced TWICE. So the kind electrician said it maybe the microwave at fault. We went and purchased another microwave from a supermarket, fitted it and NO MORE tripping out on the electrics. It definately was the microwave, because brought it home and it tripped the main electric breaker on our home circuit. Swift needs to get its act into gear, because WE wont buy another from the swift and associated company. Lost all confidence in the manufacturers. Now for the bad bits!!! All minor faults you might think but to top it all the van then had to go back to the factory for 7 weeks as it had 50% damp on both sides and 30 % on front windows, this resulted in new bottom rails being fitted,top corner caps ,front window replaced,wind deflector re-sealed and a number of what i was told minor defects repaired. All this from a new caravan purchased in 2011 at a cost of 20k, time Swift got there act together this is our 7th Swift caravan and the last !! We have a 580 (but not at the price above !!!!!!!) several issues prevail. 1. to change the awning lights you have to replace the whole unit! plus iake it to a dealership to get the job done !!!! 2. Water pump really noisy, had it replaced after 2 months, still as noisy. 4. Heki roof light blind clip. in the lounge area UNAVAILABLE to order…. 5. Battery(AA) change to heater in lounge is very fiddly unnecersary if the manufacturers can fit a piezo ignighter to the hob, then why not to the heater? 6. The mattress needs some form of holder round it, because it slides away from the head area whilst in normal use. In the bedroom. 7. The lighting in the bathroom area is totally inadequate. The light is in the alcove above the trinket shelf, so when using the basin at night the shelf obscures the basin, even is using the shower light as well, this is obscured by the shower cubicle. Where did you get this unit at this price? ?